My passion for printmaking began in 2009. I was studying fine arts at UBC Okanagan in Kelowna, BC, Canada, and I asked my advisor if there was a course I could take that would introduce me to digital photography while allowing me to continue developing my drawing skills. He suggested an introductory silkscreen course that I signed up for right away. I was immediately hooked. 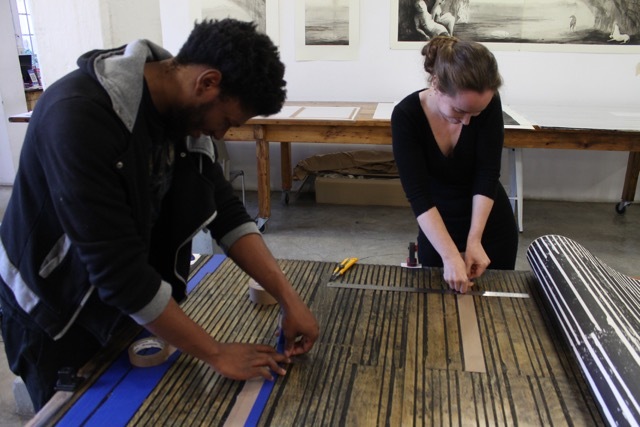 I studied silkscreen printing for three years, then took a course in etching and relief printing. Fast forward a year. It’s 2014, and I am studying for a Master’s in Fine Arts at the University of Regina in Saskatchewan, Canada. Every Friday, the Visual Arts Department hosts a visiting speaker, an artist or creative professional, who gives a presentation on some aspect of his or her work. 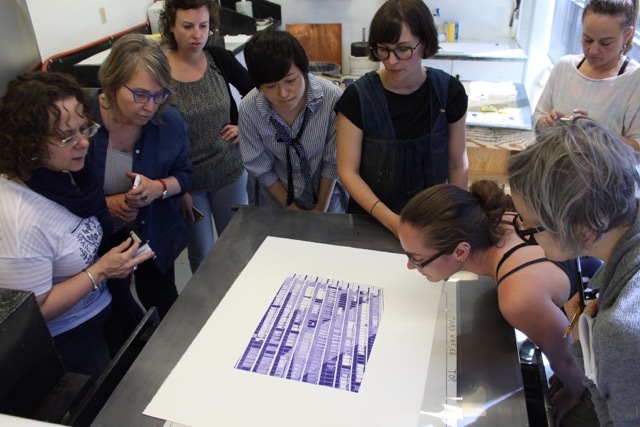 One Friday, the speaker was Jillian Ross, a Canadian who now lives and works in Johannesburg as the manager and master printer at David Krut Workshop. At lunch after her talk, I asked what I would have to do to come and work in Johannesburg. Jill offered me an internship on the spot. Then grad school took over my life, and I put Johannesburg on hold. Enter 2016. I have finished school, am teaching a class at the University of Regina, and looking online for professional development opportunities. I see Jill’s name on the Banff Centre’s website as a visiting faculty member. I applied for a residency there and was accepted. When my class was finished, I went to Banff, Alberta, to learn some new etching techniques from Jill. During my month in Banff in the spring of 2016, Jill renewed the invitation to intern at DKW. In the fall of 2017, I finally had the resources to plan the trip, and I bought my plane ticket. Today is June 1. 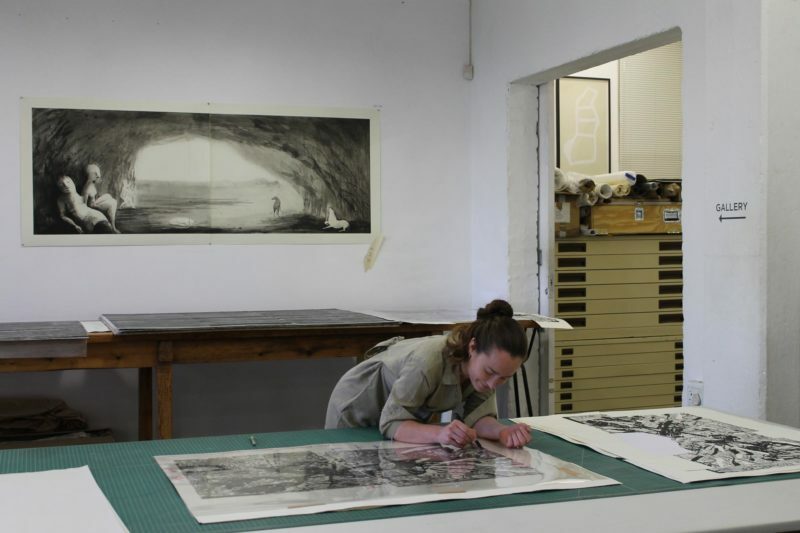 I have now been at DKW for four weeks and I have three weeks left to learn all that I can from the incredible and talented team here, and to try and make a useful contribution to the printers and artists who are the heart of the workshop. I have attended two international printmaking residencies previous to coming here, but no experience was quite like this one. Firstly, this is the first time my goal was to help others produce their own work, rather than creating my own artistic projects. This is also the first time I have experienced the traditional master-apprentice studio model. In my schooling, I developed and produced my own projects from start to finish, with conceptual and technical discussions amongst professors and peers, but not with a group of people all working in concert on a single project. In the collaborative model at DKW, it is amazing to see how several people, each one with a unique set of ideas and technical skills, can alter the outcome of artists’ projects. Something extraordinary happens in a studio when people are working together with a common interest that simply would not happen with one person working alone. I am so grateful for the opportunity to visit Johannesburg and meet this bunch of amazing printers and artists.